The first freshwater event in the history of the America’s Cup World Series has been hailed as a huge success that showcased the sport at its finest. Swedish team Artemis Racing took the overall first place in Chicago, but it was SoftBank Team Japan that stole the headlines, winning two of the four races and claiming their first overall podium finish. Dean Barker and his team got off to a great start, winning all four of the practice races that they started on Friday June 10. And when racing was abandoned on Saturday due to light and unstable winds, this result was scored as an official race. SoftBank Team Japan carried this form into the second day of racing, winning Race 4 to take third place overall for the America’s Cup World Series Chicago with a grand total of 56 points. 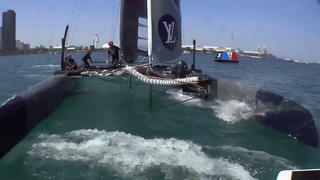 The first freshwater event in the history of the America’s Cup World Series has been hailed as a huge success that showcased the sport at its finest. Swedish team Artemis Racing took the overall first place in Chicago, but it was SoftBank Team Japan that stole the headlines, winning two of the four races and claiming their first overall podium finish. Dean Barker and his team got off to a great start, winning all four of the practice races that they started on Friday June 10. And when racing was abandoned on Saturday due to light and unstable winds, this result was scored as an official race. 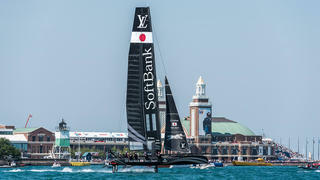 SoftBank Team Japan carried this form into the second day of racing, winning Race 4 to take third place overall for the America’s Cup World Series Chicago with a grand total of 56 points. Chicago certainly lived up to its reputation as the Windy City on the practice day, and the gusty conditions caught out two of the favourites. 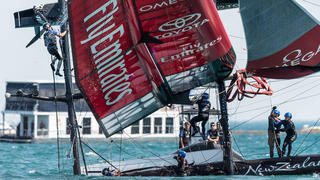 First Emirates Team New Zealand (pictured above) and then Oracle Team USA flipped over, but fortunately both teams were able to recover their AC45 catamarans and resume racing. It was a weekend to forget for Groupama Team France, who finished last overall and had to contender with an overnight repair job after a collision with Land Rover BAR on the first day of racing. Ben Wright, shore team manager for Groupama Team France, explained: “Just after the start there was a port and starboard incident when BAR ducked our transom, but they didn’t quite make it and we had a little hook up on the way through. “The damage wasn’t particularly bad, it was in the back section of the boat where the rudder is mounted so it is a little bit of a sensitive area, and even though it was a glancing blow off the back it still made a bit of a mess of it, so it was a bit of a long night for us making the repairs.” The sixth place finish leaves Groupama Team France rooted to the bottom of the overall leaderboard with 234 points. It was a weekend to forget for Groupama Team France, who finished last overall and had to contender with an overnight repair job after a collision with Land Rover BAR on the first day of racing. Ben Wright, shore team manager for Groupama Team France, explained: “Just after the start there was a port and starboard incident when BAR ducked our transom, but they didn’t quite make it and we had a little hook up on the way through. The sixth place finish leaves Groupama Team France rooted to the bottom of the overall leaderboard with 234 points. Regardless of the mixed fortunes of the six competing teams, there is no doubt that the America’s Cup World Series Chicago was a huge success, with a record-breaking crowd of more than 200,000 fans turning out to watch the action unfold. 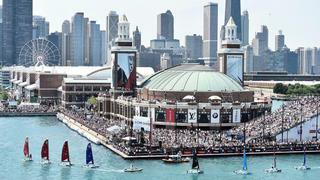 Both Navy Pier grandstands were packed out throughout the weekend, while 40,000 people flocked to the sold-out Race Village area. What’s more, a fleet of around 1,000 private boats assembled on Lake Michigan to get an even better view.